The purpose statement of Murrieta United Methodist Church is “Loving God, Loving Others, and Serving People”. Clearly, the purpose of the Missions Team is Serving People…both people outside the church who are in need, as well giving people inside the church the ability to carry out the Isaiah text which says “…Then I heard the voice of the Lord saying, Whom shall I send? And who will go for us? And I said, Here I am, Send ME. “This page will briefly describe the various mission opportunities for service that exist in the church now. We encourage each member of the church to pray about getting outside their comfort zone and stepping into the service of God. You will go to serve others, and in all likelihood, you will come back feeling as though you were the one served. It is an amazing transformation God will bring over you…but you have to start by saying “Yes”. Hurricane Harvey Relief BlogFood Pantry:Started in the year 2000, the Food Pantry has been serving all families who arrive on a Friday morning and say they need food…no questions asked. Food is provided. As of 2015, there are 120-150 families served each week. There are lots of roles for you to fill when you step up and say “Send Me”. You can be a shopper which means going to one of our partner retailers and picking up donated food or purchasing items with pantry funds. Or you can be a sorter that will go through the donated food, refrigerate food that needs it, fill shelves with canned food and sort through fresh vegetables, bread and other items. Lastly, you can volunteer to be one of the workers on Friday mornings, to serve food, pray with those who come, and generally be part of the physical “Serving People” part of our purpose statement.You can get a flavor of the food pantry in action by watching this video. To volunteer to help, please contact Ann Hartwig and Kathy Pyle by clicking here. Started in 2015, we now provide additional services to the Pantry Patrons. Among those services is a monthly breakfast served on the last Friday of each month, along with periodic services from aid organizations. Long-range plans include upgrading the kitchen to allow for more frequent meals to be served and a plan to have showers available on campus. Here again, if you hear God calling you, there is a need for people to work behind the scenes to cook the food and to serve the food. What a joy it is to see the lines of hungry people waiting to enjoy a hot meal.You can see the breakfast being served in this video. Volunteers are welcome by contacting Mark Sorensen by clicking here. Joshua Tree Breakfast:The Joshua Tree Breakfast sprung from a district-wide effort to reach out and help one of our smallest churches to provide a needed service to the community. 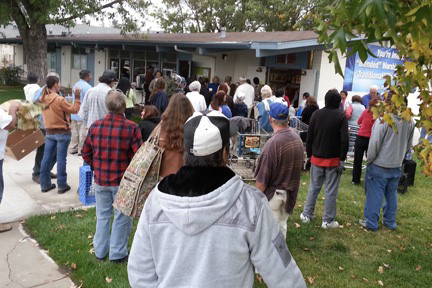 Joshua Tree has an unusually large number of homeless or at-risk families and individuals. Our church joined with 12 other United Methodist Churches throughout Riverside and San Bernardino Counties to rotate the putting on of a hot breakfast weekly. The breakfast was started back in 2009 with each church funding, cooking, and serving the breakfast approximately once a quarter. Breakfast is served to around 100 individuals starting at 9:00 every Saturday morning. The event also provides a place for social gathering, Christian fellowship, and a large clothes closet where patrons can pick up free ‘gently used’ clothes.Murrieta sends a team of ten people on each trip, leaving Murrieta at 5:30 a.m. for the two hour trip through the desert. The team is usually back in Murrieta by 1:00 p.m. Tom and Jeanie Pilkington are leading this ministry …and you are welcome to come along. Contact the Pilkingtons by clicking here. Colonia Santo NiñoColonia Santo Niño is a small community of something like 3500 people about ten miles outside of Mexicali, and about 180 driving miles from Murrieta. The Missions team has been sending people on mission trips for years to places needing disaster recovery….disasters like Hurricane Katrina and Hurricane Sandy, to disaster recovery in Haiti, Guatemala, Russia and others. The team reasoned, it might be better to select a location closer to home, so that participants could get there more easily and without costly airplane fares. Colonia Santo Nino was selected for that reason, but also because Pastor Tom Rothhaar had been instrumental in helping their small church (shown in the picture) to develop a wide variety of ministries including a dental and medical clinic that serves the people. Unfortunately, the ministry lost steam when Pastor Tom retired and eventually, because the church, called Prince of Peace Methodist Church, lacked funding and vision to continue on their own. By January of 2015, all of the ministries were closed down, the community center was in poor repair suffering from a leaking roof, the electricity was turned off, and the water and sewer hookups were, shall we say unsatisfactory. The people had lost hope.Teams from Murrieta have been to the Colonia four times so far in 2015 (January, February, April and May). Trips are currently scheduled for June 15 (1 day), July 11 (3 days), and the week of October 25 (5 days). The four completed trips, as well as the three scheduled, have been used to rebuild the buildings, replacing plumbing, electrical service, air conditioning, flooring, paint and roof leaks. We have also had fun with the kids of the Colonia, getting to know the congregation, and helping them get into ministry themselves by distributing health kits (provided by MUMC) to the immigrants, deported from the USA. Another new ministry that we have started is a weekly movie night showing family-friendly movies and Christian-themed movies that are used to reach out to the community and bring new families to the church. We are currently working on an apprentice program that helps to give recent high school graduates…or drop outs…an opportunity to be trained in a trade, and the all-important dental and medical clinics that are gearing up to provide weekly services to the community without cost. The rebuilding projects will essentially be complete by the October trip, and planning is under way for what comes next.You can read trip reports of each of our trips to serve the people in the Colonia by Clicking HERE. You will notice that the early reports were about what we were doing for the church and community center and as time goes on, it is more about how the church gains confidence and starts reaching out. Praise God…missions DO make a difference. Click HERE for the Trip Reports.You are invited to participate by helping financially, providing family-friendly or christian-themed movies (in Spanish), and praying for the community, the pastor, and the team members who travel and stay at their own expense. If you are wanting to go along, we encourage you to pray, get a PASSPORT, and let us know of your interest. For more information, contact Tom Pilkington by clicking here. Mission projects we support financially:Scott’s Family Ministry: We financially support the Scott’s family ministry in Cameroon, Africa, where they are engaged in translating the Bible into the local language. Because of their work and the work of others, Christianity is growing faster in Africa than anywhere else in the world. The Scott’s manage a team of translators that tackle the job of first figuring out a written word in the local language for words in the Bible (which in some cases may not exist!) and then painstakingly translating the Bible into the local language. Habitat and Heifer: We also financially support the Habitat for Humanity which builds and restores homes in our area; and we support the Heifer Project that gives animals which produce food to poor people around the world…. believing that it is better to teach people how to raise food-producing animals rather than simply giving them the food.